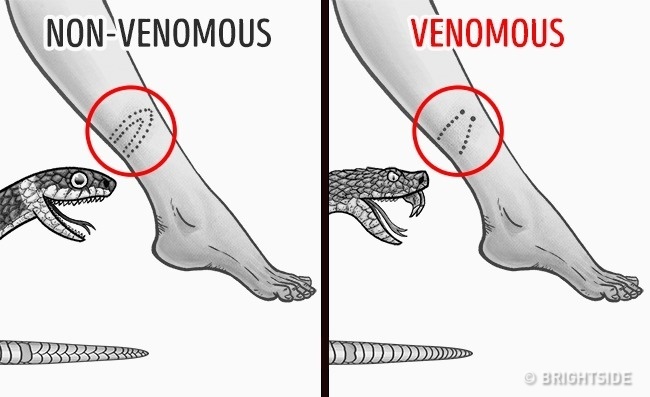 If you were bitten by a snake, don’t panic. It might not have been poisonous. A poisonous snake leaves large clear holes made by the front teeth. Non-poisonous snakes usually have 2 rows of teeth. Poisonous snakes’ pupils look similar to cats’. Non-poisonous snakes have round pupils. Poisonous snakes have solid scales on the ventral side of the body. Non-poisonous snakes have forked scales.